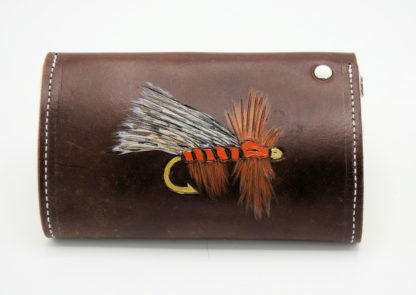 Hand tooled and colored leather Fly Fishing Wallet Case lined with sheepskin fleece. The leather is high quality vegetable tanned English Bridle Leather. 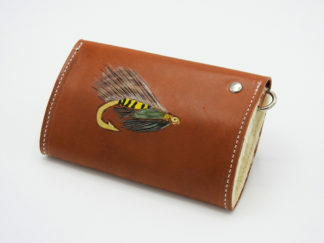 The case is designed to hold fishing flies and keep them dry. The closure is a sturdy #20 snap. 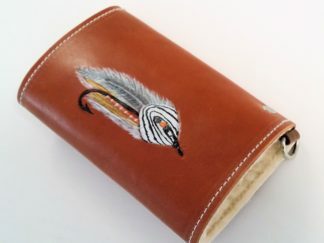 The wallet leather is not only glued but also stitched to the sheepskin fleece. 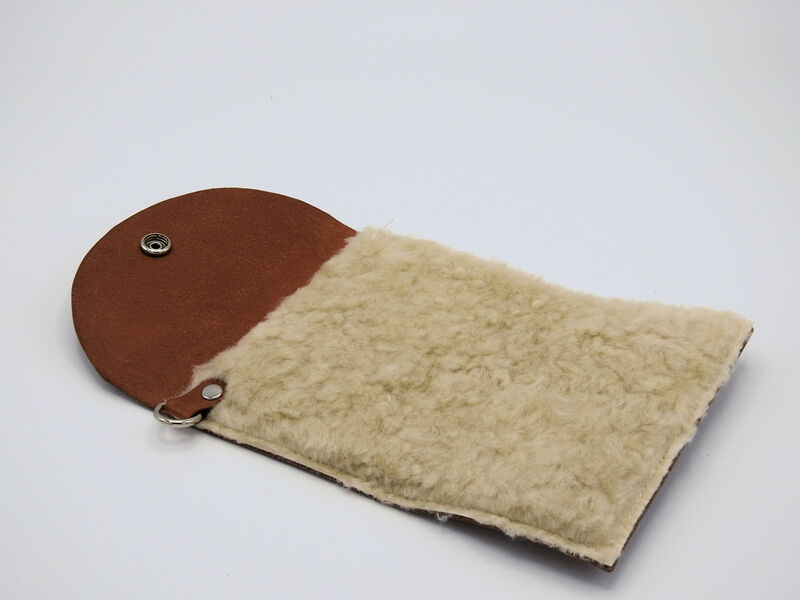 The sheepskin fleece will absorb the moisture from wet flies and keep them dry so they float. A hand tooled and colored leather Fly Fishing Wallet Case lined with sheepskin fleece. The leather is high quality vegetable tanned English Bridle Leather. 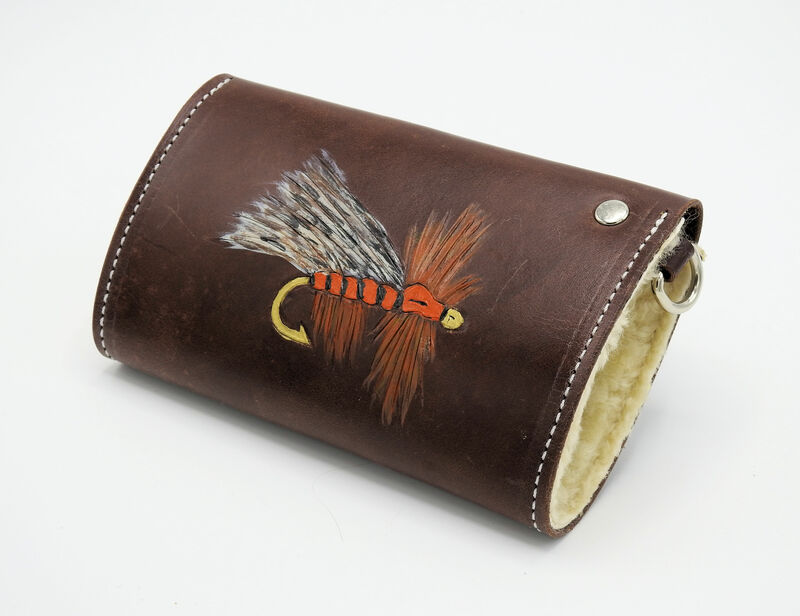 The case is designed to hold fishing flies and keep them dry. The closure is a sturdy #20 snap. 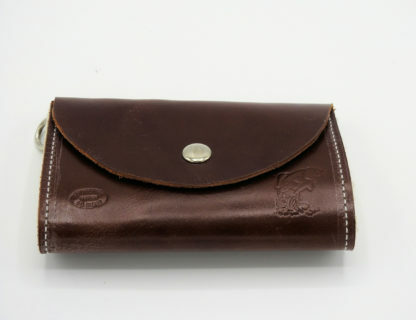 The wallet leather is not only glued but also stitched to the sheepskin fleece. The sheepskin fleece will absorb the moisture from wet flies and keep them dry so they float. The leather has a water resistant finish. 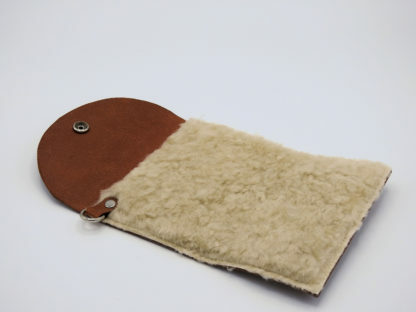 The exterior is vegetable tanned cowhide leather and inside is sheepskin fleece. A dee ring is on the side so you can hook to your vest with a carabiner, snap, or a lanyard. Message for custom colors. Lettering or initials available for custom orders…price depends on number of letters. Three initials are $8 extra and up to 16 characters for $16. Please message for custom orders with lettering and I will make a special custom listing for you with the correct price. This listing is ready to ship. 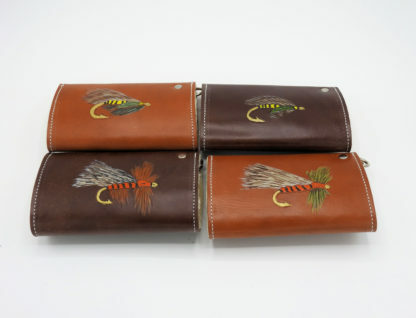 The picture with multiple wallets is a sample of other wallets I have done. The measurements closed are 6″ x 4″ and open 6″ x 11″. At present I only ship to the US (all 50 states) but no APO’s. I try to ship either priority or first class for smaller items. Tax is charged only in Colorado.